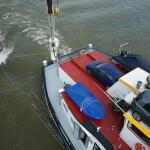 I am sitting high above the Rhine River in the wheelhouse of “Glissando”, in Duesseldorf. One hundred twenty kilometers upstream fom where I made fast last night around 10.30 p.m. The current ran very swift and Marinus had to teach me a couple new tricks on how to steer the boat in this fast current while getting the lines on to “Fleetwood”. I had heard so many discouraging comments on what to expect on the tow by such a large powerful river barge. But Marinus has it all under control and all went very smooth. The river runs at about 5 to 6 k.m./hr and the barge’s over the ground speed is about 8 k.m/hr. So, that means roughly about 8 nautical miles per hour through the water. You get the picture from the photos. The system that Marinus worked out is to have the main tow line attached to his starboard transom and an additional line from my bow to his port transom. 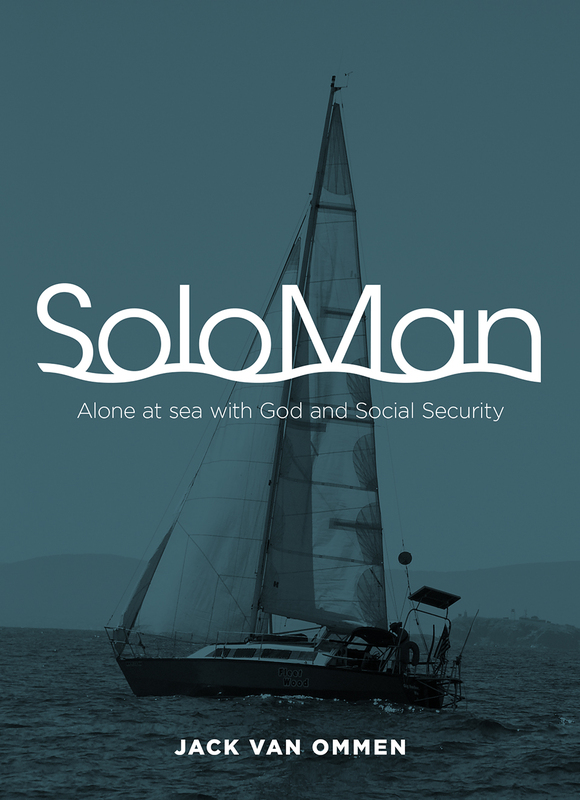 Then the helm is set to make the boat always try move about 15 degrees to starboard; that way the boat travels to the side and away from the prop wash in quieter water. The line to the port side keeps the boat from moving too far off to starboard. I did not have to steer at all and after becoming a believer managed to get a few hours of sleep. The boats that make the worst waves and severely test the integrity of my mast transport are the recreational stink potters who have no clue of the damage they leave in their wake. The Hoogendoorns have two of their three sons, the one daughter, a brother Kees with his wife and two daughters and a girl friend of the #2 son on board and 4 cars. They are all across the river to a beach with their runabout and water ski gear while I make sure that every one knows where Jack is. 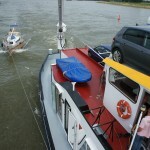 The Hoogendoorns plan to have their own Sunday service aboard. I am waiting to hear back from Hubert Ahrendt, my nephew (twice removed??) who lives near here, to come and visit me tomorrow. 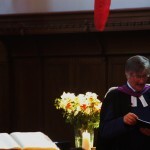 The Hoogendoorns will have a family Sunday service on board tomorrow. We leave early Monday for Koblenz. I could have never ever have made the trip up the Rhine under my own power and it was a stroke of luck to get the offer from Marinus when I was in the Virgin Islands, last year March. The pictures below show how Marinus took the aerial shots. Hung from a trapeze in the crane. The crane is mostly used to get the cars on and off the ship. You’ll count 4 cars on deck for this trip. 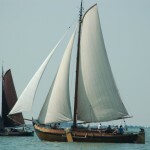 Marinus used the crane to get back on board “Glissando” after we left Lobith and he felt certain that things were under control on “Fleetwood”. “Glisando” is expected to arrive earlier than first expected. We are to rendez-vous here in Tolkamer/Lobith this evening around 10 p.m. I arrived here already at 9.30 a.m. figuring to be staying the night here. Last night I anchored in a bay off the river about 10 k.m. down stream. Yesterday was a bit blustery but I had the wind from behind. The current is now quite noticeable and on the last part I slowed down to about 3 1/2 knots/hour. 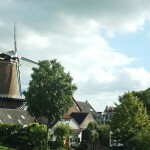 I passed by Rhenen, Oosterbeek and Arnhem. I went under “The Bridge Too Far”, in Arnhem, where the allied forces were pushed back by the Germans in the fall of 1944. The totally flat landscape of Western Holland has now changed to rolling hills. I’m still learning the tricks of handdling the boat with the mast sticking out so far behind me. When I pulled away from the dock in Wijk bij Duurstede I did not realize that a high piling was in the way when I turned away from the dock. The top of the mast hit and I broke the base of the tricolor masthead light. It can be fixed. Then I had another battle in the locks at Amerongen. The previous lock I had been able to raft up on another boat and the couple crew handled my lines bow and stern and since I moved up with their boat did not have to worry about changing the lines to the higher wall cleats. In the second lock I was on my own and I was not prepared for the strong flow of water rushing in, pushing my bow away from the lock wall. I managed to hang on to the bitter end of the bow line with all my force but the mast end once again struck the lock wall, no harm done, but another lesson learned for a new trick. At least on the ocean you get a little more time to figure out the new plan. Single handling is a new game on this part of the trip. And there is very little opportunity to go below for more than a minute because of the winding rivers and the traffic. We will stop in Cologne for the Sunday and then continue to Koblenz on Monday morning, where we expect to arrive Monday evening. I will be staying on “Fleetwood” for this night and see how things go. I hope I’ll get some sleep and get used to the new way of travelling. Marinus called me today. 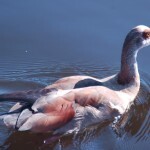 He is loading salt in Amsterdam on Friday destined for Koblenz and I expect to meet him early Saturday morning in Lobith, where the Waal river joins the Lower Rhine, on the German border. Then I will wait again in Koblenz for a tow to Mainz. Koblenz is where the Moselle River joins the Rhine. It is a beautiful old city and will be a good stop. I have a choice to meet “Glisando” in Tiel on the Waal river, which is closer by but I prefer to see the countryside of the Lower Rhine, which will take me past Rhenen, Wageningen and Arnhem. There is only a very moderate current against me on this route. I plan leave in the morning. Last night was a beautiful full moon over the junction of the Lek and the Rhine River but I could not dig out my tripod to show you a good picture. 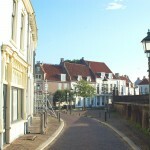 This morning I went for an early walk through the town of Wijk bij Duurstede. 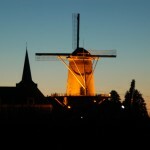 The 14th century windmill, the Sint Jan’s Church and the medieval castle and the well preserved old walled city make this a very worthwhile stop. 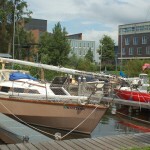 I moved from the Euro 1.50/ meter city dock to the 1 Euro/mtr marina. A very pleasant and peaceful spot. There is a steady flow of river barges and pleasure boats moving up and down the river. I made some improvements and reinforcements to the mast shoring. Sofar I have no idea yet as to when I can expect to leave here. But I have plenty of chores to do while waiting. I did not get going till 3 p.m. on Sunday. But I managed to get to a nice and quiet moorage on the Veght River by 8 p.m. at Nichteveght. I followed the standing mast route to the “IJ” , the Amsterdam harbor, even without the mast standing the bridges all had to be opened and this took time and then I looped back into the city east of the Central Station, this was a hairy experience the fixed bridges on the “Oude Schans” and beyond to get to the Amstel River cleared the solar panel by all of 6″ (15 cm). Another trip through memory lane; passing under the Berlage Brug in my old neighborhood. This Amstel River bridge was the only bridge to cross from our neighborhood to the East river bank, other than a ferry boat to the south of it. The Liberators in May 1945 crossed this bridge into Amsterdam and we rode, as 8 year olds, on their tanks and trucks into Amsterdam through the crowds of the liberated. 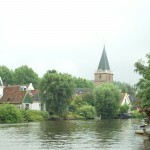 Then the Weesper Trekvaart, another favorite destination for us a kids to explore,to Weesp on the Amsterdam-Rhine Canal. The weather was dark, rainy and blustery, so, not good for picture. Today was not much better. 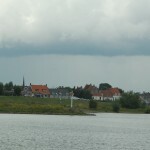 The Veght is a beautiful river, lined with historic town and old castles. Many dating back to the 17 th century. 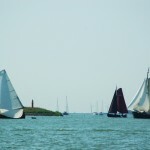 The wealthy Amsterdam merchants had their summer homes along the river and sailed their Jacht’s there from Amsterdam. This was a real treat and I took lots of pictures. After Maarsen I decided to skip continuing on the Veght through the city of Utrecht, to save time and distance, and went into the Amsterdam Rhine Canal. This is used by the large barges and it can get a bit rough from their wakes and prop wash. I had been warned. 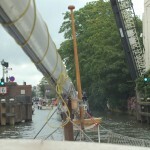 In order to get from the Veght I had to go through an open narrow lock. I was following two other power boats. 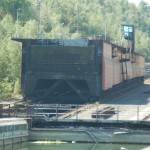 The all of a sudden I see this enormous German empty barge rush by very close to where the lock exit was. It through up an enormous wake that threw up the water inside the lock in all directions. It looked like I was going to lose the mast. I could not reverse in the narrow space. I was committed. I had to do a fast reshoring job. My autopilot decided to give the spirit once again. So that made leaving the helm very difficult. My next peril was in the Princess Irene locks, where the canal crosses the Lek River. I was the first boat in line so I thought I’d better tie up inside the lock. As another singlehandler I know likes to exaggerate (who can verify our stories anyway?) : “I looked death in the eyes…” . Apparently sport boats are not to enter the locks until the commercial vessels are in. So, I was tossed between the barges by their prop wash and came close to getting the boat crushed between these monster barges. I heard some nasty sounds when it happened but apart from some nasty scratches on the hull and rub rail “Fleetwood” survived. A hard lesson learned. I have another 68 locks to share with these behemoths before I get to the Danube…. 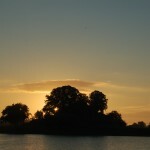 I got to Wijk bij Duurstede, on the Lek River, at 4.30 p.m. I plan to wait here for Marinus Hoogendoorn once he has a freight to tow me to Mainz on the Rhine River. This is an old city with Roman period origins and walls. I hope to see more of it tomorrow. I can take pictures here without having to try take it over the heads of the tourist throngs and the streets are not littered with parked cars. This is a true jewel. “Afgetuigd” has a double meaning. Anyway the mast is down for the next adventure. It took most of yesterday. There were several maintenance/repair jobs performed after the mast was down. The boom had pulled off the mast on the Atlantic crossing and now I was able to take off the temporary fix of three heavy duty hose clamps and replaced the four 5/16″ machine screws with 3/8″ screws and retapped the threads that had completely corroded. Two wires that lead through the mast to the tricolor/stroble masthead light were replaced. 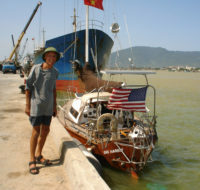 I made up braces to carry the mast the nearly 2000 miles to the Black Sea. 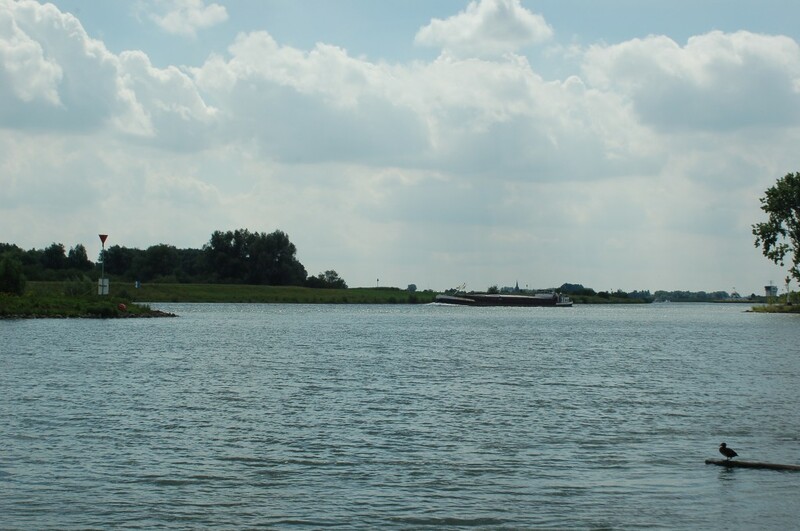 I plan leave here on Sunday, via the Amstel, Vegt, Amsterdam-Rhine canal to Wijk bij Duurstede and be ready there for the time that Marinus Hoogendoorn has a freight going up the Rhine. This could take days/weeks. But I have plenty projects to work on while waiting. The Dutch summer continues to spoil us with warm sunny weather. But daylight is getting noticeably shorter. Tomorrow there will be many goodbyes here in Amsterdam. My teenage years friend Joke Brancart just left. I plan to try and be in Amsterdam for Christmas when the boat is in Turkey. Sunday 18 July. The Virginians are airborn again. It is early Sunday morning. 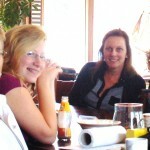 Jeannine and Gabrielle are on the way back to Virginia from their two week Holland holiday. They met 18 relatives, 8 of my generation, 5 of Jeannine’s and 5 of Gabrielle’s. For my granddaughter Gabrielle was this her first visit and Jeannine had not been back since she left as a 6 months old in the first days of 1970. 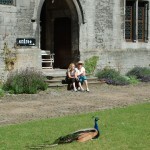 My twin brother Jan and his wife Catharina visited here with us from Germany on Friday and Saturday. 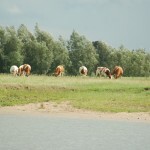 On our second day, Wednesday, of our Belgium visit, we toured the countryside near Ittre. In Ecaussinnes we visited the mideval fortified Castle and at Ronquieres watched the inclined plane on the canal that runs just behind the house we lived in in Ittre. Pleasure boats and large cargo barges are lifted 225 feet in waterfilled caissons. On the way back to Holland we stopped in Brussels. I showed the Virginians where Rose Marie, daughter # 2, was born at the clinique Edith Cavel. We had lunch in the Bois de la Cambre, in the same spot where I often used to eat lunch with my colleagues during the 4 years I worked in Brussels in the late sixties. 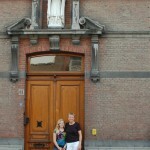 On Thursday we saw the “Hiding Place” in Corrie ten Boom’s home in Haarlem. 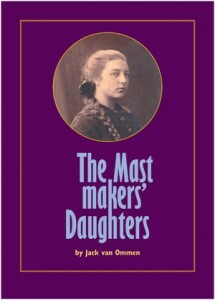 Corrie was in the same concentration camps with our mother and participated in the secret bible readings they held in Vught and Ravensbrueck. The Virginians toured the Anne Frank house in Amsterdam in the evening. Yesterday afternoon we spent several hours in the excellent exhibits of the Resistance Museum. I have to get busy now and prepare the boat for the long river trip. Last night, after the thunderstorms and downpours calmed down, we had a family affair at the “de Schinkel” marina. Jeannine and Gabrielle got to meet her two nieces Phoebe from Amsterdam and Phoebe from Perth. My nephew Dirk Jan was there with his two sons and my sister and brother in law. We left early today and spent about three hours in Brughes. Most of it in the Bequinage and the Our Lady Cathedral. 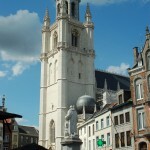 Our next stop was Halle the Flemish city near Brussels where Jeannine was born, April 12, 1969. We found the hospital, which is no longer used as a hospital. 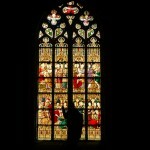 I had forgotten how charming Halle is and the Basilica of Saint Martin dating back to 1267 is one of the most beautiful churches I have ever visited. 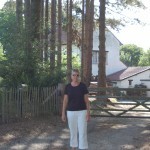 We looked in at the house we rented, when Jeannine was born, on Rue du Mazy in Ittre in the French speaking part of Belgium just south of Brussels, where Napoleon fought his last battle. 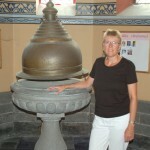 The church where Jeannine was baptized in Ittre was open. We are staying at the Relais du Marquis and just finished dinner nearby. The farm raised mussels are in season, so the choice was easy. Gabrielle is in her fourth year French and she was able to read and order from the menu. The rolling hills and the large centuries old farmhouses with their white washed stone walls, the smell of the Linden tree blossoms brings back sweet memories of the wonderful years we lived here in the late sixties. We stopped at the nearby village of Braine le Chateau with one of the very few surviving pillories and the castle of the Count of Horne who was decapitated together with the Count of Egmont by the ruthless Duke of Alva during the 80 year Spanish war in the Low Lands for their support of the Dutch Prince of Orange against the Spanish Inquisition. 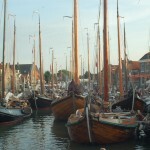 The city of Hoorn in my previous blogs and the Cape Horn were named after the Count of Horne. July 12th. The Monday after. The Dutch lost the battle against Spain. Feliz Espana! En komplimenten aan Nederland. 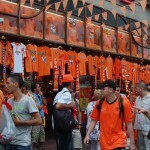 The Dutch played well and the Dutch team will be celebrated tomorrow here in Amsterdam in a parade through the canals. Here are a few more pictures of this memorable weekend. 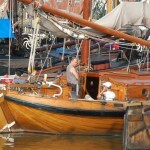 The one picture of the Amsterdams Havenkoor was taken Saturday in Monnickendam. 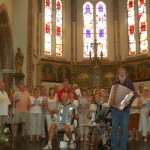 During the Jan Haring sail race weekend 14 shanty choirs livened up the town, moving from various locations, in four old churches and on the terraces of three popular pubs. 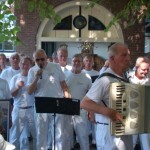 At 5.30 that afternoon the 14 groups with more than 500 singers joined together on the main square did a sing along for everyone in town of 5 popular “hurten songs” tear jerkers, including “Op de Woelige Baren”. I had sung that song with the Amsterdamse Havenkoor last October at the “de Schinkel” 90 year anniversary party. The Dutch know how to party. One thing is for certain this summer in Holland will live long in my memory. I am very fortunate and blessed. Sunday afternoon. All orange goes on sale today….